Another day, another splendid watercolour by Thomas Rowlandson. This is one of a number of original paintings by Rowlandson that will be going under the hammer in London later this week and it’s expected to fetch somewhere in the region of £3,000 to £4,000. The image shows an accident at a warehouse which has resulted in a fully-laden barrel plunging towards the crowd passing along the busy thoroughfare below. The scene itself is reminiscent of the images Rowlandson engraved for the Miseries of London series from 1807 onward and may even be a draft version of a print from that series which was either discarded or has subsequently been lost. The picture also highlights the artist’s skill as a humourist, with the image being frozen at that perfect moment when the comedy of the spectators undignified scramble for safety is still at its height, and just a split second before the tragedy that it seems will inevitably occur as a result of the barrel’s impact. It’s possible that the picture was based on actual event. 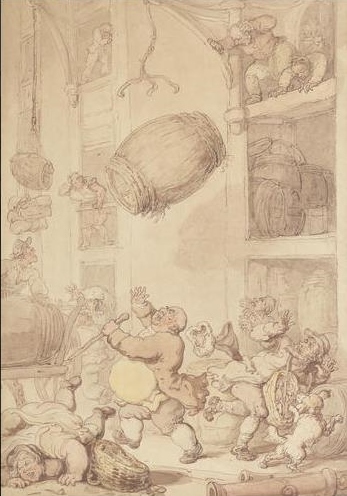 Rowlandson’s close friend and fellow caricaturist John Nixon owned a company that dealt in the Irish provision trade and lived above his company’s warehouse on Basinghall Street in the City during the 1780s and 90s. 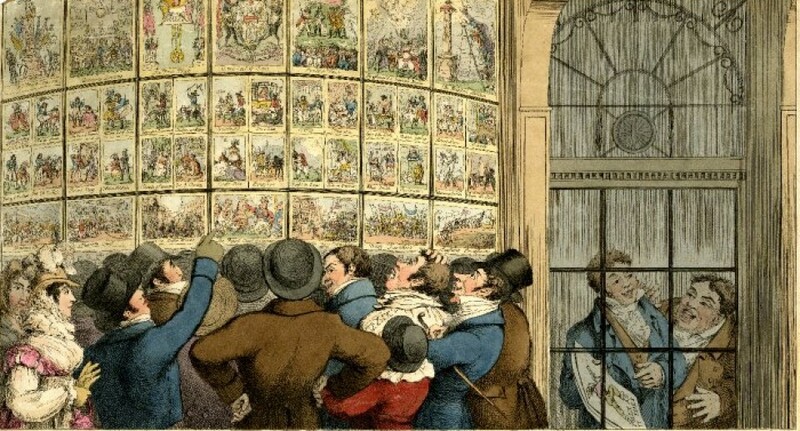 Nixon was a generous entertainer and it seems almost certain that Rowlandson would have visited the site on any number of occasions and may either have witnessed, or been told about, an accident which had taken place there. However, even if the incident itself was real, it is almost certain that the characters portrayed here were not. 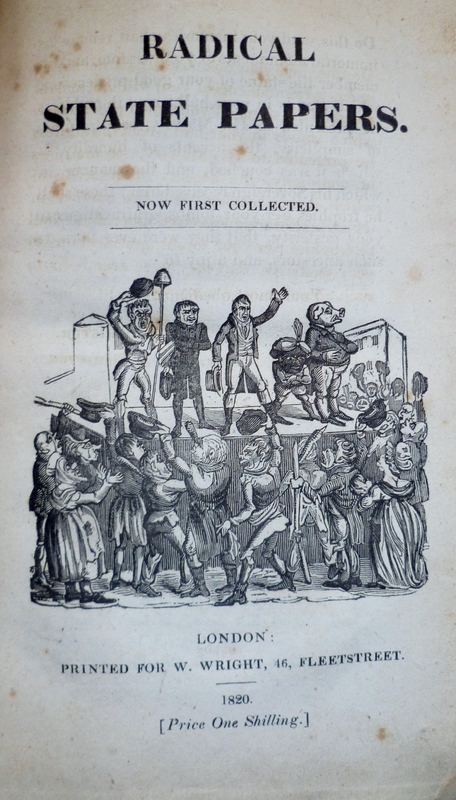 The central figure of the fat squire losing his wig and hat appears in a least two other prints published around 1810-11 entitled Doctor Drainbarrel conveyed home in order to take his trial for neglect of family duty and Rural Sports, Balloon Hunting respectively, while the market-woman sprawling across the floor seemingly reappears in the traffic jam Miseries of London plate published by Ackermann in 1807. It therefore seems safe to assume that these were stock figures lifted from Rowlandson’s extensive library of comic grotesques. The rapid expansion of Britain’s manufacturing and commercial sectors during the second half of the eighteenth-century meant that warehouses such as these would have been found all across central London. The City and the parishes of Whitechapel and St George in the East, were home to the largest single concentration of warehouses, particularly following the construction of the massive West India, East India and London dock complexes during the first decade of the nineteenth-century. The size and level of investment in these warehouses gives some indication of both the sheer volume of goods flowing through London in this period and the dynamism of the Georgian economy. In 1799 Ralph Walker, the engineer responsible for designing the West India Docks, calculated that the site would require ten five-storey buildings, 224ft by 114ft and 40ft apart, with five 8ft-tall storeys for 80,000 hogsheads of sugar, basement vaults for 25,000 barrels of rum, and attic space for lighter goods. In the end only eight were built but at a total cost of £276,800 which is equivalent to roughly £52 million in today’s terms. Accidents of varying severity must have been an everyday feature of life in eighteenth-century London’s docklands. The combination of warehouses stuffed with highly flammable materials and an almost complete lack of building regulations meant that the risk of fire was omnipresent. In 1861 a fire that broke out in the counting house of Scovell’s warehouse near Tooley Street, ripped through the surrounding streets and incinerated a large section of the Thames waterfront before finally being brought under control. Smaller mishaps, like the one depicted above, were also a predictable consequence of dealing with a workforce which consisted almost entirely of cheap, unskilled, labourers who had been plucked at random from the streets. The docks were some of the largest employers in the metropolis and while they retained a permanent workforce of skilled labourers such as carpenters, coopers and rope-makers, at least two thirds of the men who worked there were retained on a daily basis. At 7.30 every morning a ragtag mob of a thousand or more men and boys would gather outside the gates of the major docks to jostle for one of the few hundred casual jobs available. Once the foreman came out “then begins the scuffling and scrambling, and stretching forth of countless hands high in the air, to catch the eye of him whose nod can given them work… some men jump up on the back of others, so as to lift themselves high above the rest and attract his notice. All are shouting.” Even after the quota had been filled and the yard gates closed, dozens of stragglers might hang around for the rest of the morning in case a a ship arrived late on the tide and extra men were suddenly required. All this for privilege of earning just 4d an hour.